Each year we celebrate Tu B’Shevat with a wonderful seder! Unlike a Passover seder, we celebrate the trees, especially from Israel. Why? Because it’s spring there (and we wish it was spring here as well)! Unlike the Pesach seder, this one is not a complete meal. 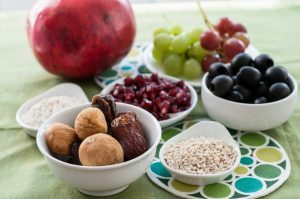 However, part of our celebration involves eating fruits and seeds of many trees: oranges, carob, almonds, dates, cherries, peaches, and more. Most of us leave with very full bellies, so eat a light dinner in advance -or not- your call. Although there is no charge for this event, a donation of $3–5 per family is requested to help cover expenses and to plant trees in Israel in memory of Temple members who have died in the past year.